Jean de Brienne, a distant cousin of the King of France, was born into a Huguenot family early in the sixteenth century. When the Regent renounced the Edict of Nantes, it suddenly became lawful to murder Huguenots with impunity and so Jean decided to escape to England with the aid of the Channel Freedom Riders, a secret people-smuggling operation. Once in Canterbury, Jean de Brienne soon came to the attention of some of the aristocracy and the Royal Navy. The growing public animosity toward the Huguenots from the English population was generating a level of social unrest toward Francoise and others of her friends as they strove to be cooperative and community-minded, a challenge that could not be ignored much longer. In his adventures, Jean's naval service with Sir Francis Drake brought him face to face with the phenomenon of slavery. With each encounter, Jean's morals and fundamental beliefs are put to the test and he must fight to stand up for them. About the Author Inspired by a playmate's family history, James Fearn researched the Huguenots during the Reformation period. With his playmate's approval, Fearn named his protagonist, Jean de Briene, after his dear friend. This is his fifth novel. 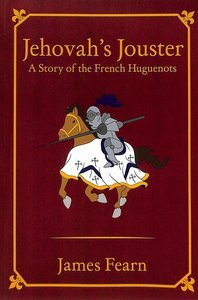 About "Jehovah's Jouster: A Story of the French Huguenots"